Pictured is our NOAA ship Oscar Elton Sette. 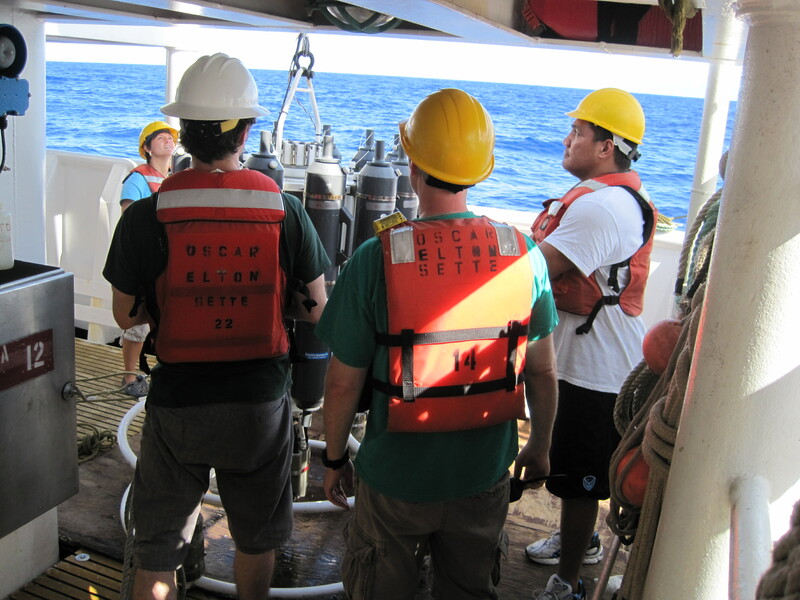 Pictured here is the entire science party aboard the NOAA ship Oscar Elton Sette. Here is a view of the forward mess onboard the NOAA ship Sette. The back deck of the Sette where most trawling operations occur. The bunkhouse sleeps six onboard the Sette. Here are the chemicals listed in the Hydro Lab. Each nght the steward, cook, prepares a salad bar in the galley. The head in the bunkhouse is equipped with two sinks. The electronics lab aboard the Sette has multiple hook-ups for computers and e-equipment. The fire ax hangs in the hallway in case of emergencies. Members of the scientific team enjoy a night in the forward mess with popcorn and a movie aboard the NOAA ship Sette. The forward mess is equipped with a television, public computers, drink and ice machines. The forward mess has comfortable sofas of the Sette. The galley is where meals are served. Three meals a day are served aboard the Sette. The galley is open24 hours a day for snacks and drinks. People work around the clock aboard the NOAA ship Sette. The gym aboard the Sette is located in the hold at the bottom most level of the ship. 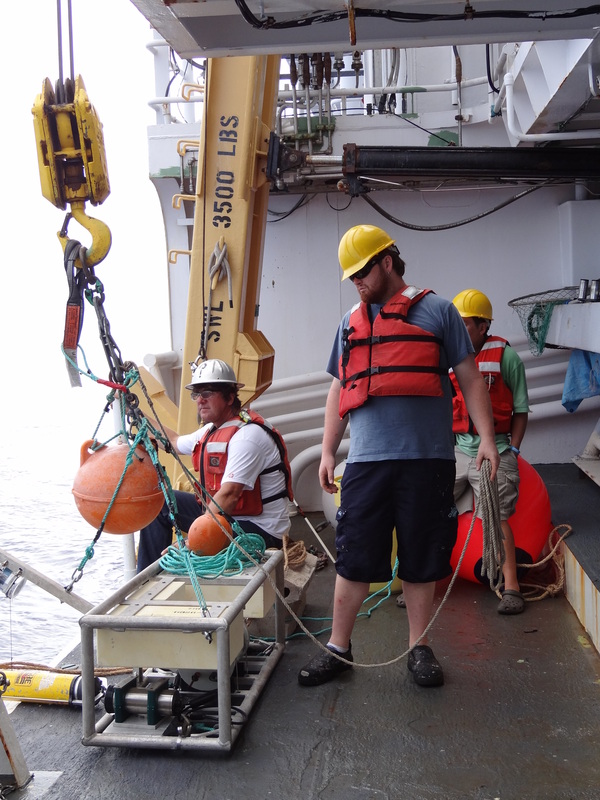 Crew members, Mike and Kelson enjoy the forward mess after their shift aboard the NOAA ship Sette. The butterfly fish is rather rare and this made the scientists very happy to see one. 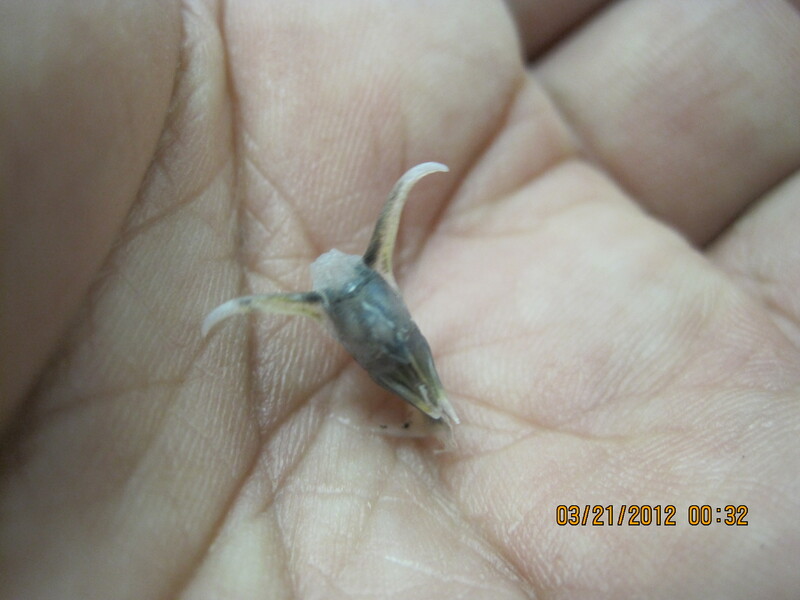 This is a juvenile butterfly fish. It is the size of a small marble and has horns. Teacher at Sea, Jennifer Fry and crew member James McDade muster on the Texas Deck during an Abandon Ship drill aboard NOAA ship Sette. bunk beds. The boat deck is where the small launches/rescue boats are stored. There is a FRB, Fast Rescue Boat, and two small launches. guests, passengers. It is also an entry point for personnel. Lower/ Galley Deck: Crew’s and scientists’ staterooms, library, two lounges, galley, where everyone eats their meals. Communications, Oscar Elton Sette maintains a Web site titled Student Connection (http://atsea.nmfs.hawaii.edu), which provides semi-weekly communication between students and the ship. Students can follow the vessel’s daily operations through regularly posted pictures and write-ups through this site. Find out more about the Corps, its mission and history from the “About the Corps” link. Q: Have you seen any butterfly fish? 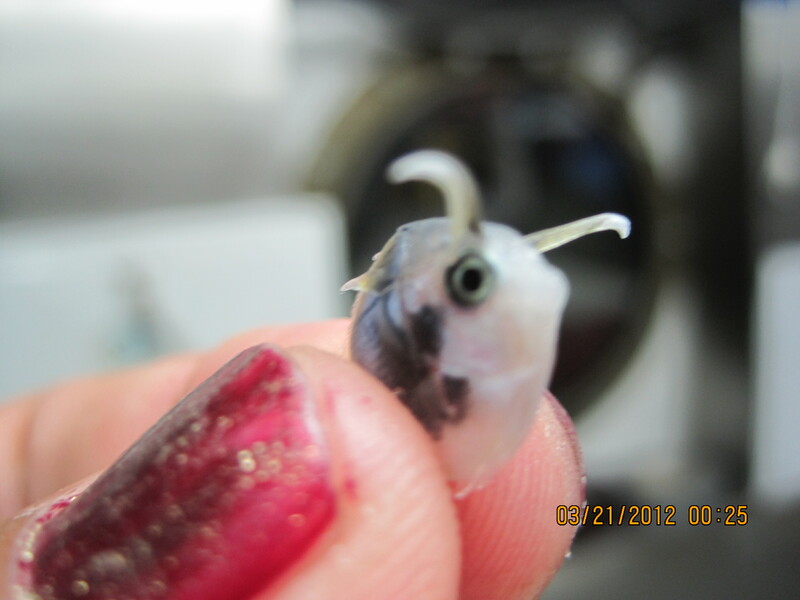 A: The most interesting butterfly fish was a juvenile. It was about the size of a marble and it had horns. It was certainly one of the most interesting specimens we caught. Q: What do you do when there IS a fire? 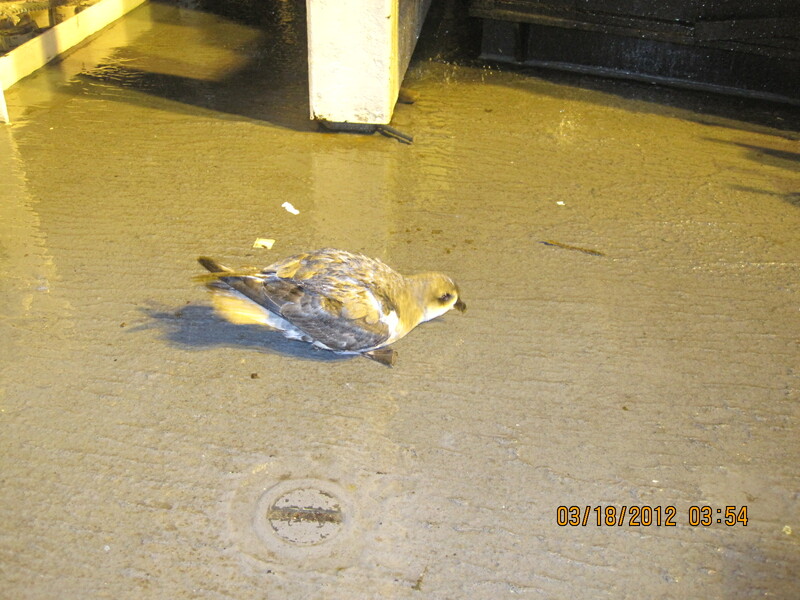 A: While onboard the NOAA ship Sette we had several fire drills. The scientists and I were to report to the “Texas Deck” which is just behind the bridge where the captain pilots the ship. 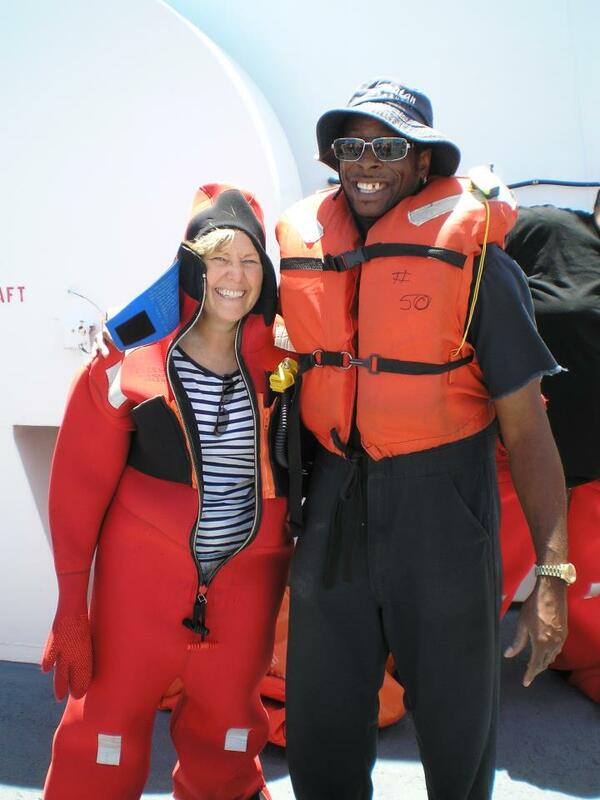 During the “Abandon Ship” drill, I learned to put on a big orange “Gumby Suit” also known as a survival suit. When worn it keeps you afloat and warm while in the water, and since it is orange, it is very visible. 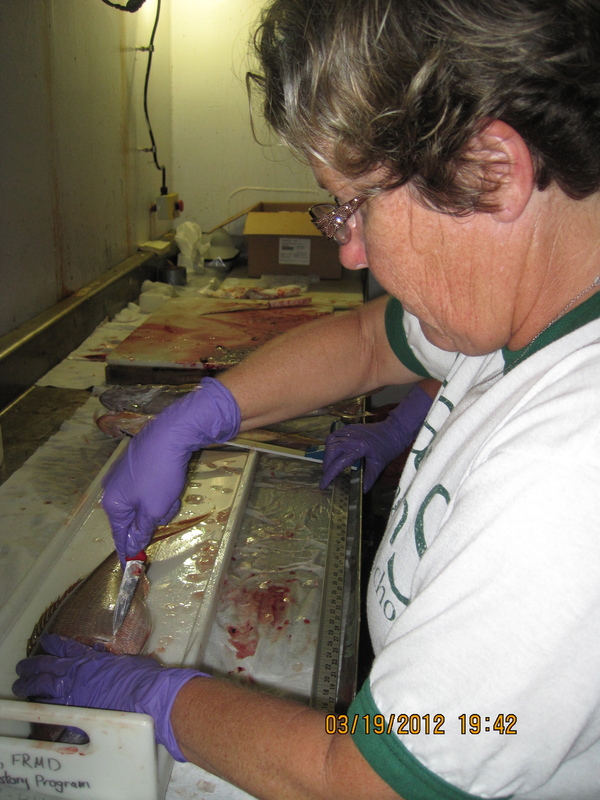 Here I am processing fish samples. The small boat SE6 is being deployed. Today I switched from the night shift to days. Joining the crew on the small boat operations was a real treat. The two 10-meter small boats are used for a variety of scientific study such as fishing, plankton tows, researching protected species, cetacean acoustic studies, and A.U.V. autonomous underwater vehicle maneuvers. Today we will be fishing the ledge of 2% Bank for snapper fish. When deployed the boats are raised and lowered off the side of the 200-foot Oscar Elton Sette for each fishing excursion. This is no easy feat, taking synchronized orchestration of all hands. First, everyone involved has a safety briefing to discuss rules, procedure and safety tips, including the ship’s captain, scientists, crew members, and the 2 coxswains , Mills Dunlap and Jamie Barlow, drivers of each boat. Once all the gear is loaded onto the boat such as fishing gear, the day’s water supply, ice chests filled with ice to keep fish cold, lunches, and personal belongings(sunscreen, hat, and windbreaker), we carefully step into the boat which hangs beside the ship approx 8 feet above the surface of the ocean. The small orange boat hangs by one strong metal hook connected through a large metal eye which secure four fabric straps at each corner of the boat. The boat dangles from the side much like a clock’s pendulum ticking each minute of time. Crew member Doug Roberts, the ship’s boatswain or bosun, is operating the crane today. The boat is then lowered taking its passengers to the ocean’s surging surface. Keeping our eyes on the large yellow metal hook, our life line to the Sette, the small orange boat descends. Once the boat hits the water, it becomes a bobbing cork, undulating with each approaching swell, frequently banging into the hull of the NOAA Ship Sette. “Boom, Bang, Bash” as the small boat hits the hull of the great hulk. Quickly pulling the hook out of the eye, the coxswain Mills Dunlap speeds away to find the daily fishing position using the boat’s G.P.S., Global Positioning System. The scientists hope to catch a nice variety of snapper species and further their study on growth patterns of fish in American Samoa waters. 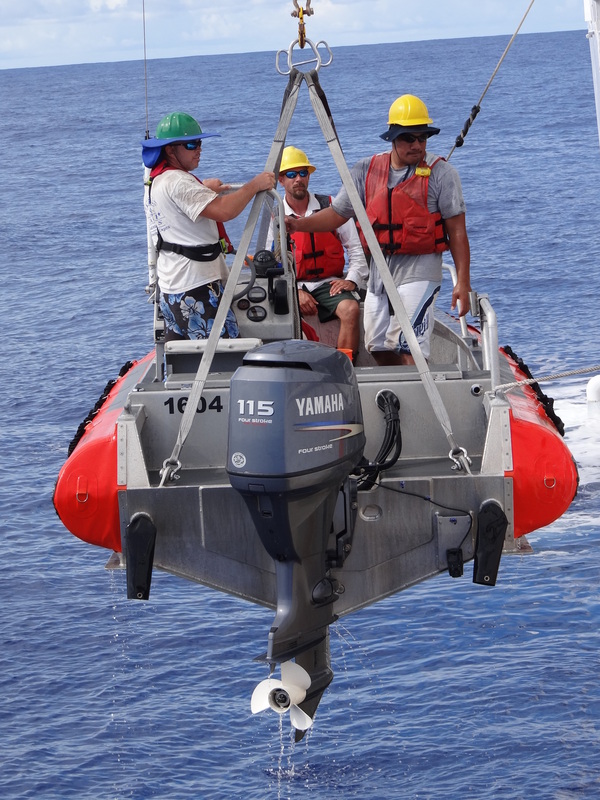 The small boat is deployed and retrieved in much the same manner, using a large hook and crane to lower and lift the boat in and out of the ocean. 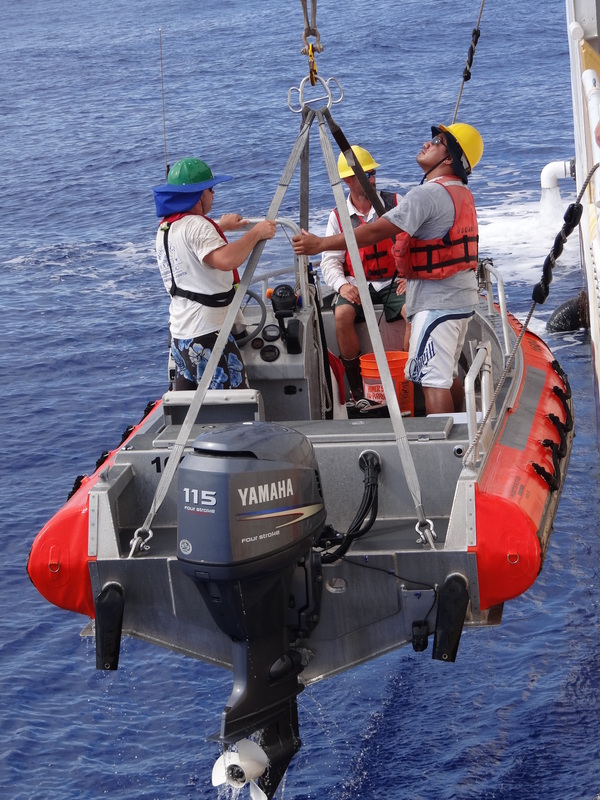 Safety is paramount when deploying and retrieving NOAA small boats. All hands wear a PFD, Personal Floatation Device and a hard hat. The seas were milder in the morning with swells of 6-8 feet which gradually made way for windier afternoon conditions producing choppy seas and blustery winds. I was on the boat with NOAA oceanographic scientist Ryan Nichols and Mills Dunlap, skilled fisherman. They both patiently taught me how to fish. Wave conditions ranged from 4-6 feet which made for being a bit unstable on my feet. Ryan has perfected his fishing technique, tying 4 fish hooks on each line, looking like a Christmas tree with each hook being a colorful ornament. This allowed us to catch multiple fish on each line. Today’s operation was to fish as close to the Bot Cam, a remote underwater camera as possible. Scientists hope to use the video tape fish behavior in the benthicpelagic range which is 100-200 fathoms deep/600-1200 feet. The Bot Cam uses a tethered camera that is later released to float to the surface, and using acoustics a.k.a. sonar readings, scientists Ryan Nichols, Pacific Islands Fisheries Science Center , Meagan Sundberg, Joint Institute for Marine and Atmospheric Research of the University of Hawaii, and Jamie Barlow , Pacific Islands Fisheries Science Center, will collect samples of fish at selected sites during the cruise. The Botcam is being deployed off the side of the Sette with the help of Dr. Kobayashi and crew members Kelson and Johnathan. Scientists are researching fish behavior, competition, species interactions, throughout the water column. Specifically they are looking at the bottom fish society, scientists refer the it as the “complex” and how they relate to each other socially, behavioral, clues into their social structure, eating behaviors, predator/prey avoidance, response to fishing gear presence. Looking at dominate and non-dominate fish behavior. Bottom fish snapper species and predator fish, Jack, a very dominate fish. The Bot Cam reminds me of the behavior when you set up a bird feeder. The fish were certainly biting. The two small boats caught approx. 40 fish that day. 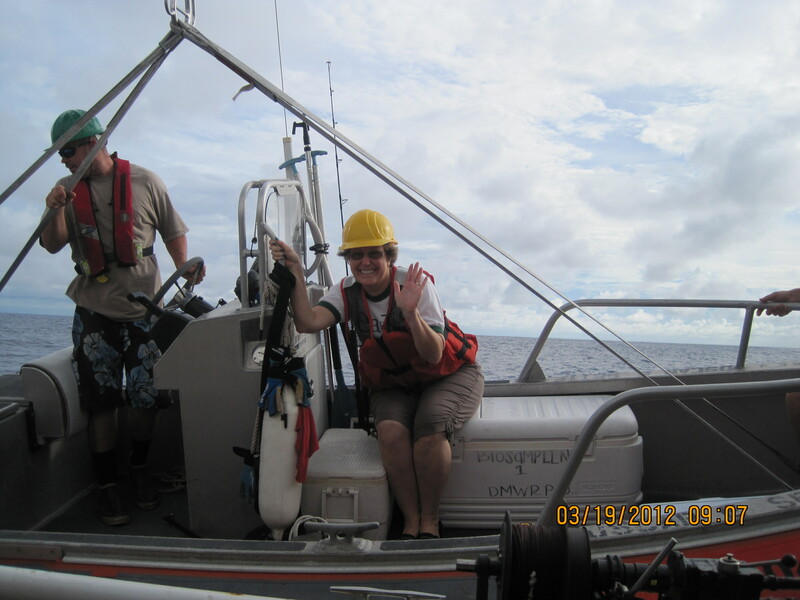 Teacher at Sea, Jennifer Fry measures and processes fish off the coast of American Samoa. harvest the odilith, ear bone, that helps determine the fish’s age. 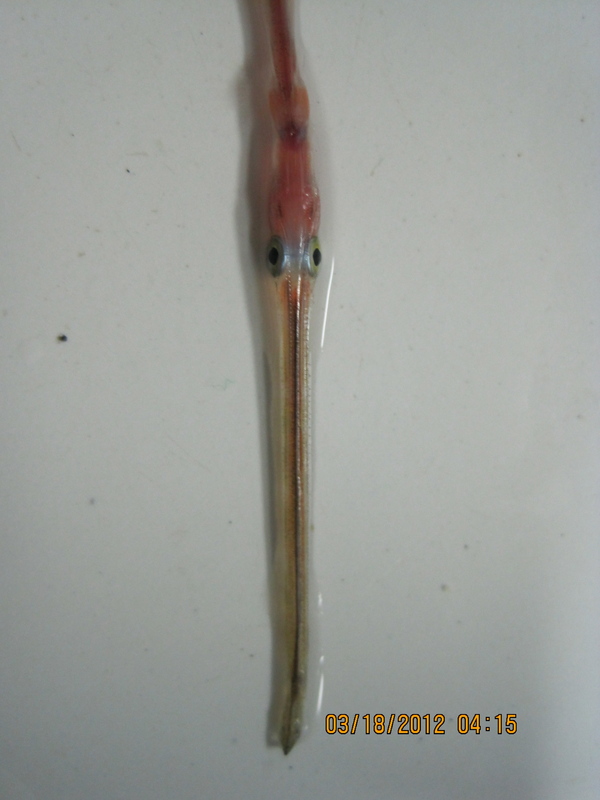 Extracting the ear bone helps scientists determine the fish’s age by reading the rings much like a trunk of a tree. Here the small boat is deployed from the Sette using a large crane and hook. Mills Dunlap, skilled fisherman pilots the Sette small boat in the waters off Amercian Samoa, during fishing operations. After a long day of fishing off American Samoa the Sette small boat and its passengers are retreived. Carefully the Sette small boat is retreived. 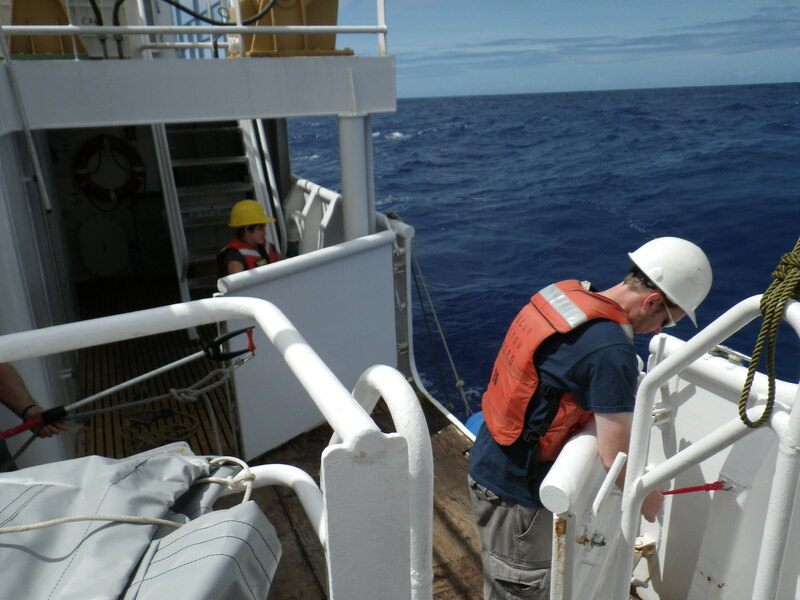 The Botcam is being deployed off the side of the Sette with the help of crew member Kelson and Johnathan. Meagan Sundberg and Ryan Nichols are seen processing the fish caught from the small boats. 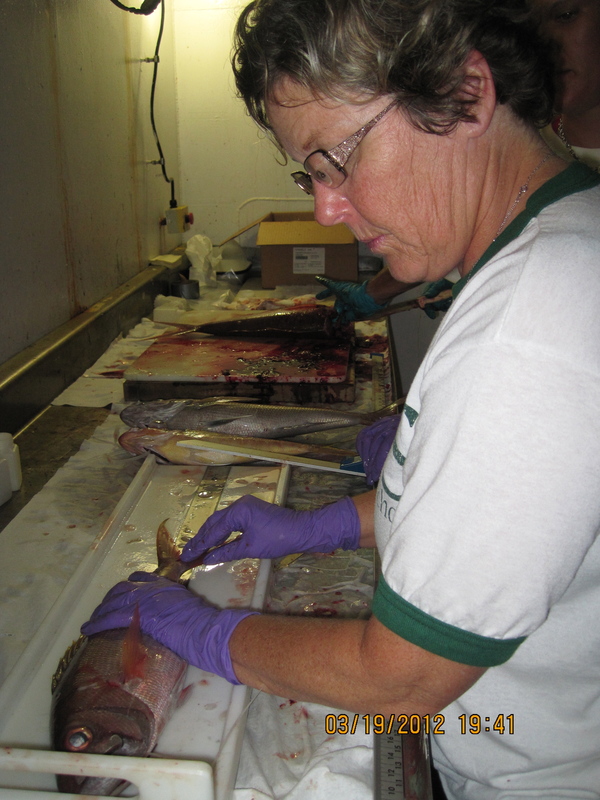 Teacher at Sea, Jennifer Fry processes fish onboard NOAA ship Oscar Elton Sette. 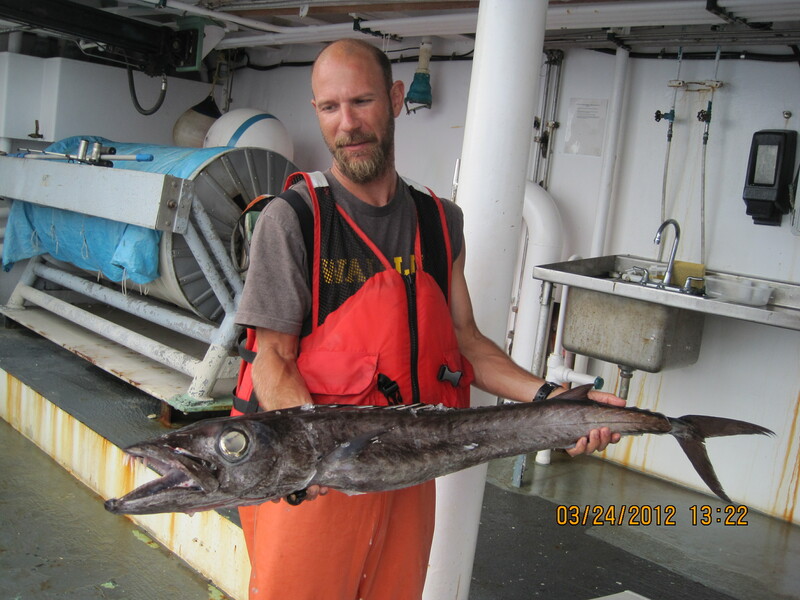 Mills Dunlap, skilled fisherman showing today’s catch off the NOAA ship Sette. Mills Dunlap, skilled fisherman, pilots the small boat in the waters of American Samoa. Boatswain or bosun (both /ˈboʊsən/): A non-commissioned officer responsible for the sails, ropes, rigging and boats on a ship who issues “piped” commands to seamen. The plankton net is towed alongside of the ship. Scientists have collected what appears to be synthetic material in the tows. These are examined by scientists using a microscope. 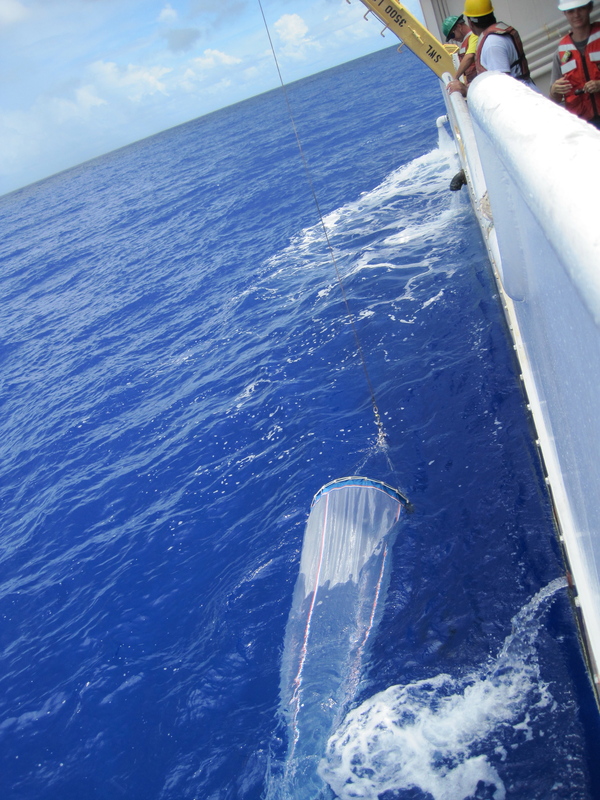 The 1 meter oblique plankton net collects marine debris that is analyzed in the lab. 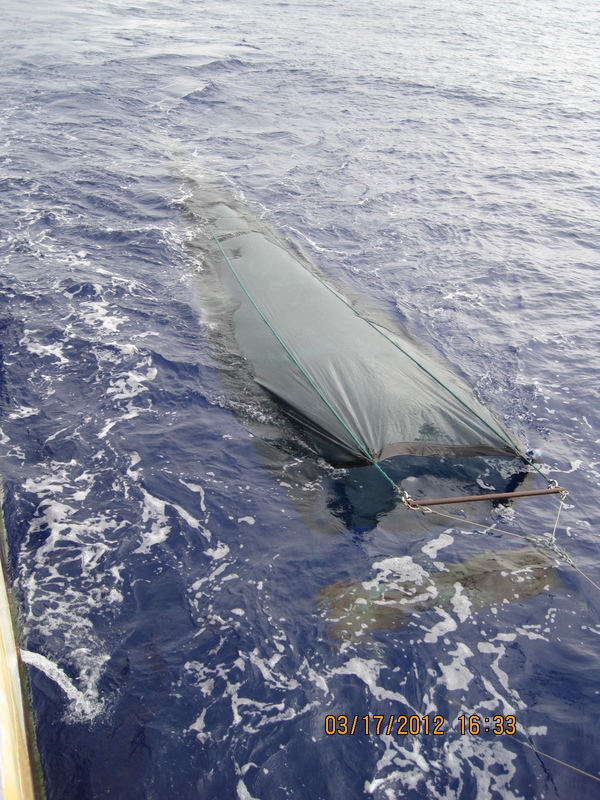 The Manta Net is a smaller unit that collects plankton and plastics at the surface. The Issacs Kidd is a larger surface net that filters greater volumes of water. The 1-meter ring oblique net collects throughout the water column down to approximately 230 meters. She hopes to conduct qualitative studies on plastics asking the question, “Are plastics present in the South Pacific Gyre?” Back in the lab, she plans to analyze each sample to conduct quantitative studies asking, “How much plastic is in the ocean?” In addition, she’s also looking to answer the question, “Are fish consuming plastic?” She will answer these questions by collecting plankton tow samples and analyzing stomach contents of fish caught in American Samoan waters. 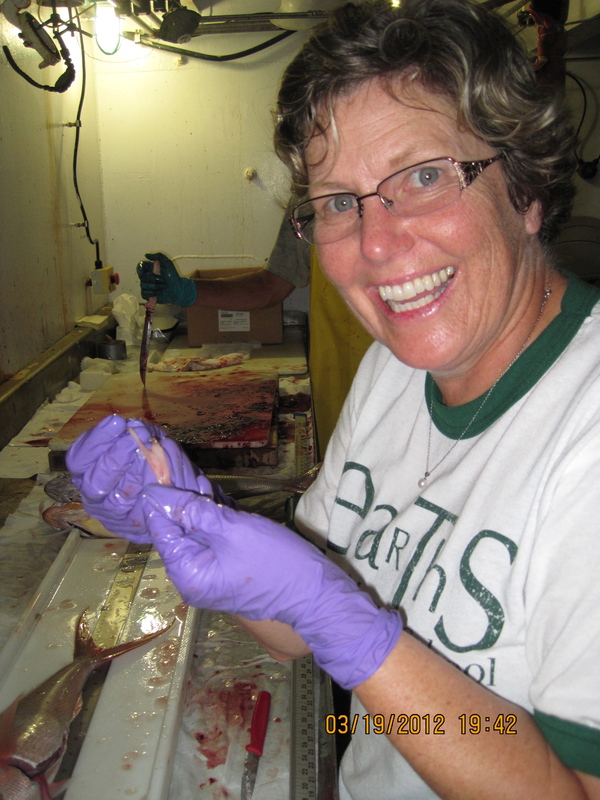 Back in lab, she will determine if fish are in fact consuming plastics as part of their diet. The theory is that different plastics have different densities depending on their chemical composition. If the plastic is less dense than salt water, it will float in the ocean. If the plastic is denser than salt water, it will sink. In this way, plastics are not necessarily at the surface. Plastics photodegrade and break into smaller pieces from sunlight and the elements. It is important to note that plastic will never breakdown into its original chemical components. Plastic will not biodegrade. She hopes to find if there is a presence of plastic in the South Pacific Gyre, and bring awareness to the world-wide problem of plastics in our oceans and in our food chain. 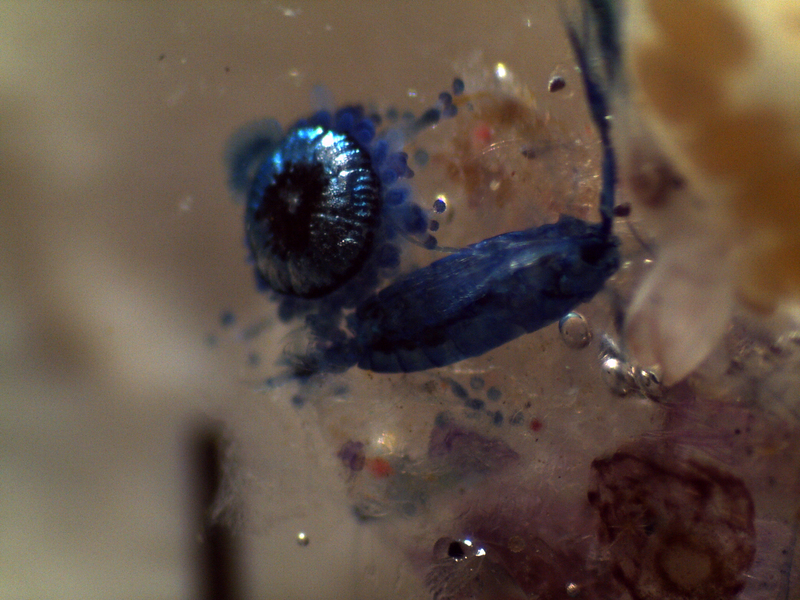 “To date we have found synthetic debris in nearly every sample using visual analysis. There are pieces of debris that appear to be plastic, however this will need to be confirmed by further investigation in the lab,” says Louise. Louise’s studies are on the cutting edge, and she is forging a new path in marine microplastics studies. To date, there is very little information on debris in the water of the South Pacific Gyre and Louise is attempting to expose the presence of plastics in the oceans as a world-wide problem. These sculpin fish and other deep water fish were caught in the Cobb net deep water trawl conducted in the early morning hours. This silver lancet fish was caught during small boat fishing in the waters off American Samoa. This lancet fish was caught today during small boat operations. My time on NOAA ship Oscar Elton Sette has been such an incredible learning experience for myself personally, and for what I will bring back to my students. My profound gratitude goes out to the dedicated science team, NOAA Corps, and crew aboard the Sette for all they have taught me. 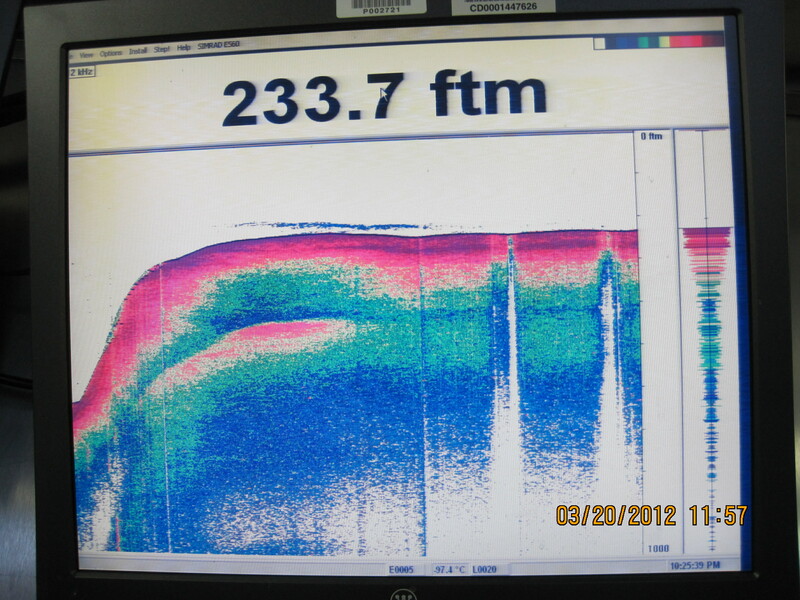 These charts show levels of salinity, temperature, density of the waters of American Samoa. The ocean’s depth is always checked prior to a C.T.D. operation to know how deep the unit can be deployed. The C.D.T. unit is safely back on the deck. Scientists collect an array of data including density, temperature, and conductivity using the C.D.T. unit. The C.D.T. is ready to be deployed into the ocean. Using a team of scientists, a crane, and crane operator the heavy unit is carefully guided into the water. Once the C.D.T. unit has collected the needed data, scientists retreive it. The crane lifts it out of the water and the unit is hooked as part of the retreival process. Once is determined safe, the doors on the side of the ship are opened to deploy the C.D.T. unit into the water. Once the crane operator lifts the unit out of the water, scientists guide the C.D.T. onto the deck. 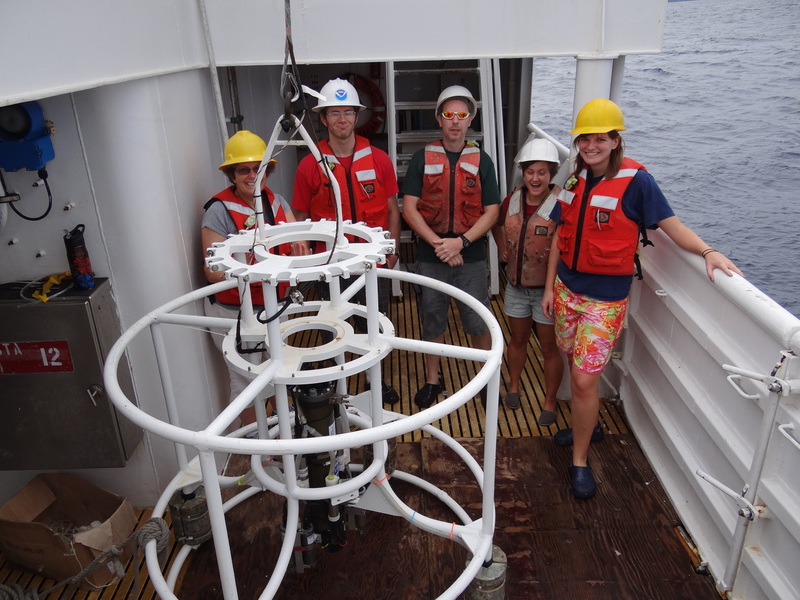 Teacher at Sea, Jennifer Fry, Survey Tech, Scott Allen, and NOAA scientists Evan Howell, Megan Duncan, Aimee Hoover enjoy learning how to safely operate the CTD unit. 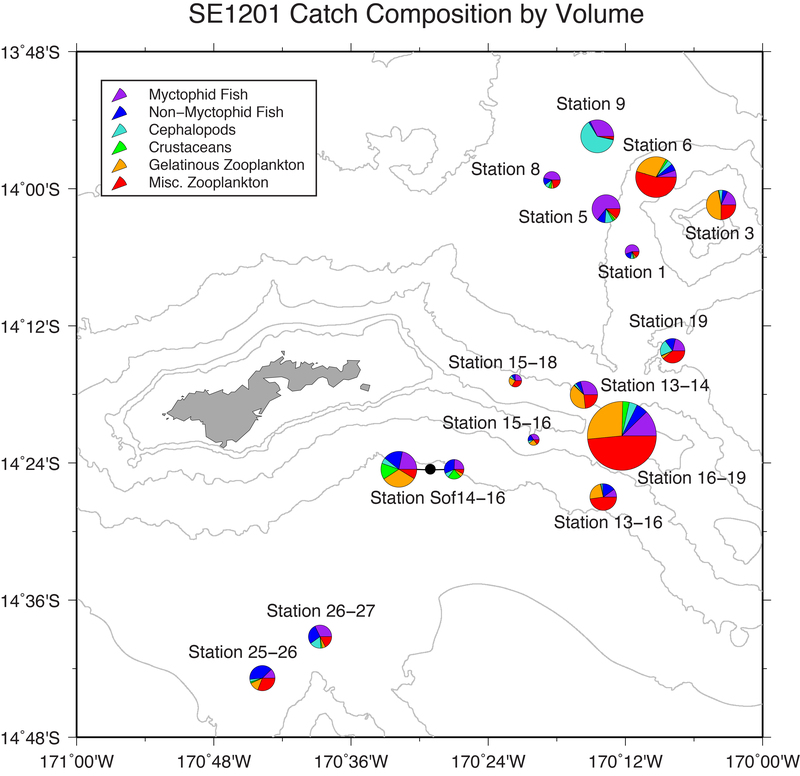 This chart shows percentages of data collected in different parts of the waters of American Samoa while on board the NOAA ship Sette. These graphs show data collected from the C.T.D. including: temperature, salinity, and oxygen levels. 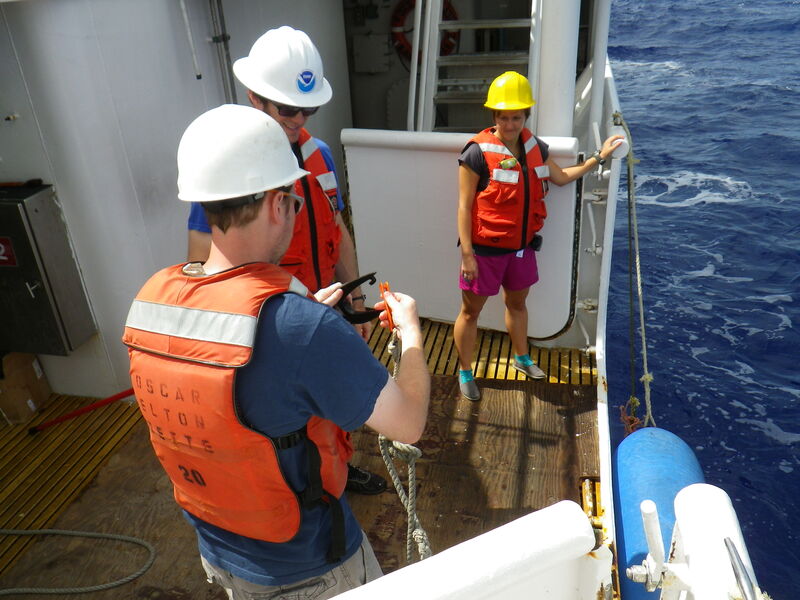 Teacher at Sea, Jennifer Fry, Survey tech, Scott Allen, NOAA scientists, Evan Howell, Megan Duncan, Aimee Hoover work on the CTD operations performing 8 casts in the day. 5.Once the crane operator lifts the unit out of the water, scientists guide the C.T.D. onto the deck. 6. The C.T.D. unit is safely back on the deck. Scientists collect an array of data including density, temperature, and conductivity using the C.D.T. unit. 4. Using a crane to lift and a hook to grab, the C.T.D. unit is guided onto the deck. 2. The C.T.D. is ready to be deployed into the ocean. Using a team of scientists, a crane, and crane operator the heavy unit is carefully guided into the water. 3. Once is determined safe, the doors on the side of the ship are opened to deploy the C.T.D. unit into the water. 1. The ocean’s depth is always checked prior to a C.T.D. operation to know how deep the unit can be deployed. 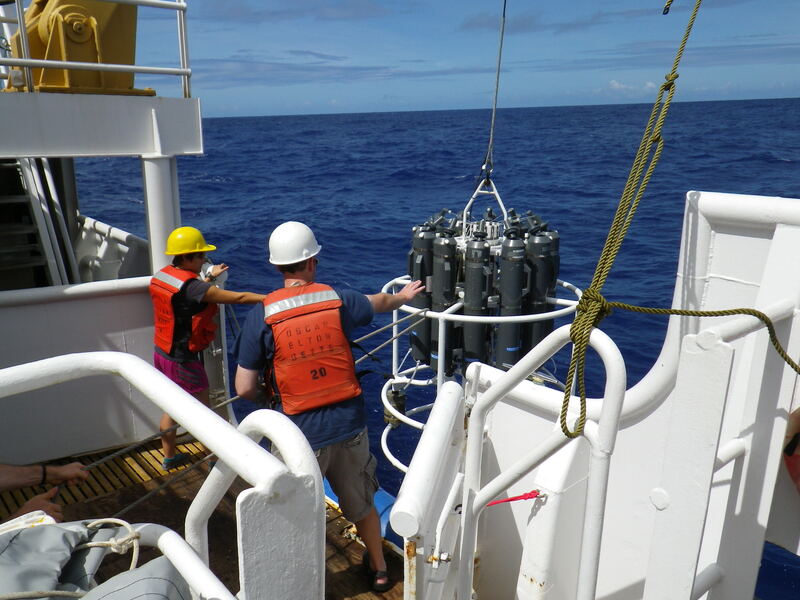 The CTD Operations onboard the Sette are conducted by Evan Howell, Pacific Islands Fisheries Science Center, Megan Duncan, Joint Institute for Marine and Atmospheric Research at the University of Hawaii, and Scott Allen, NOAA survey tech. The CTD platform, which resembles a giant wedding cake constructed of painted steel, contains multiple instruments that can measure water characteristics including pressure, temperature, salinity, oxygen levels, and chlorophyll concentration. Jennifer Fry, Scott Allen, Evan Howell, Megan Duncan, and Aimee Hoover stand behind the CTD. It takes 30 readings per second as it sinks towards the seafloor. 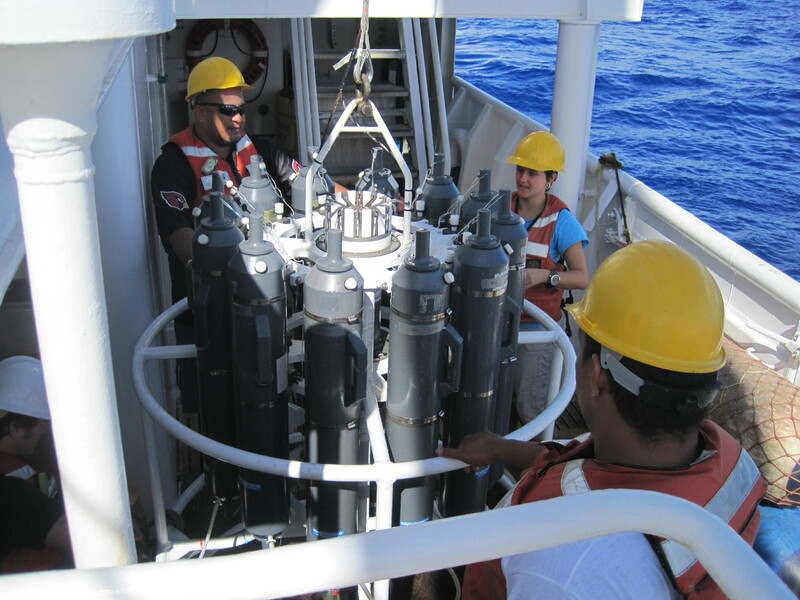 The CTD records data as it sinks and ascends, but only data from the downcast is used, insuring the instruments are recording data in an uninterrupted “profile” of the water column. 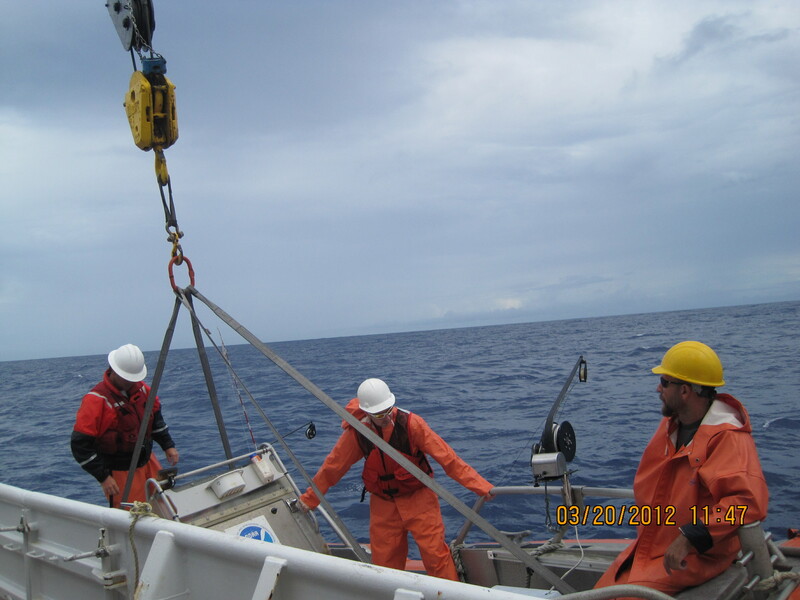 All data collected helps capture ocean characteristics. The acquired data will be shared with the American Samoa Department of Marine and Wildlife Resources scientists and compared with the data they have collected previously. 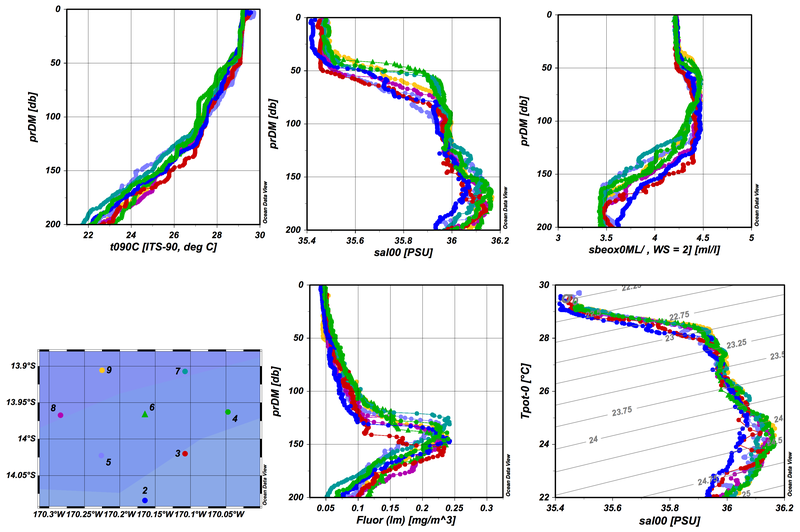 Using prior data, current CTD data, and acoustic Doppler current profiler, a type of sonar detecting water currents, scientists can determine patterns in the oceans of American Samoa and compare them. 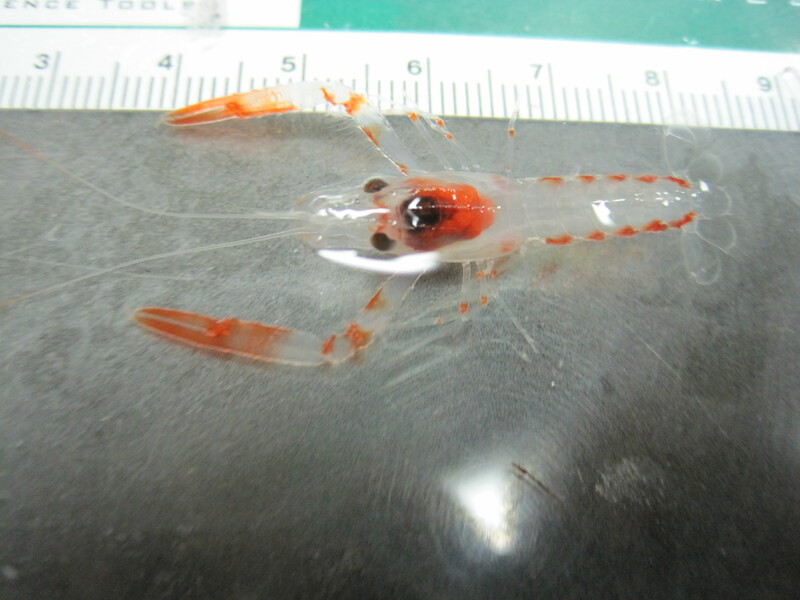 This juvenile lobster was found in the Cobb trawl net. 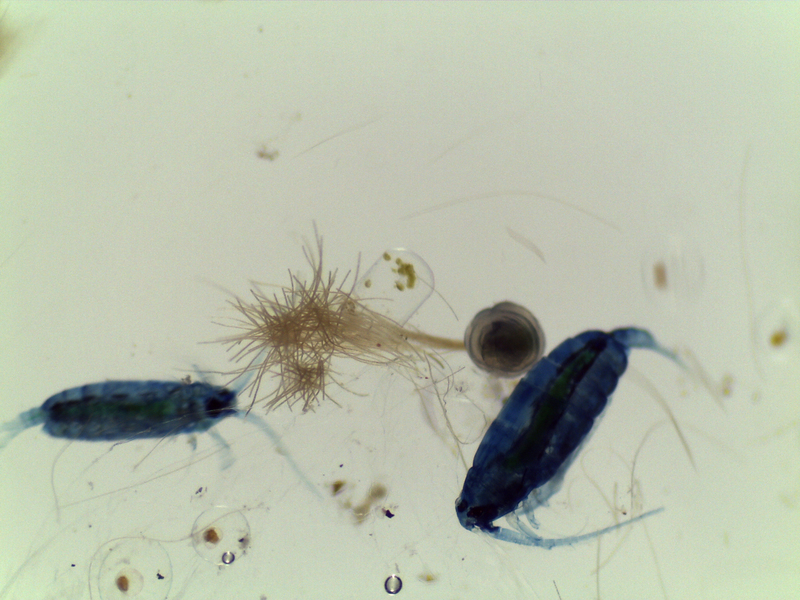 Pictured here is a copepod (right) and a jelly (left) found in the plankton net. 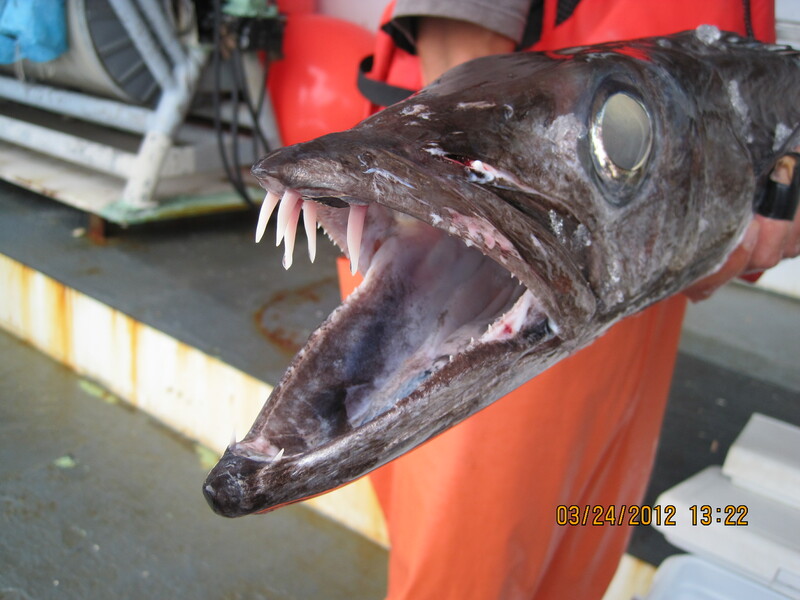 Scientists, like John Denton, often get hungry during late night trawls. Here he is tempted to eat his recent catch. Tafito Aitaoto, American Samoan scientist, looks on. The cookie cutter’s mouth can be very destructive. While biting its victim, it rotates its mouth taking a “chunk” of flesh. 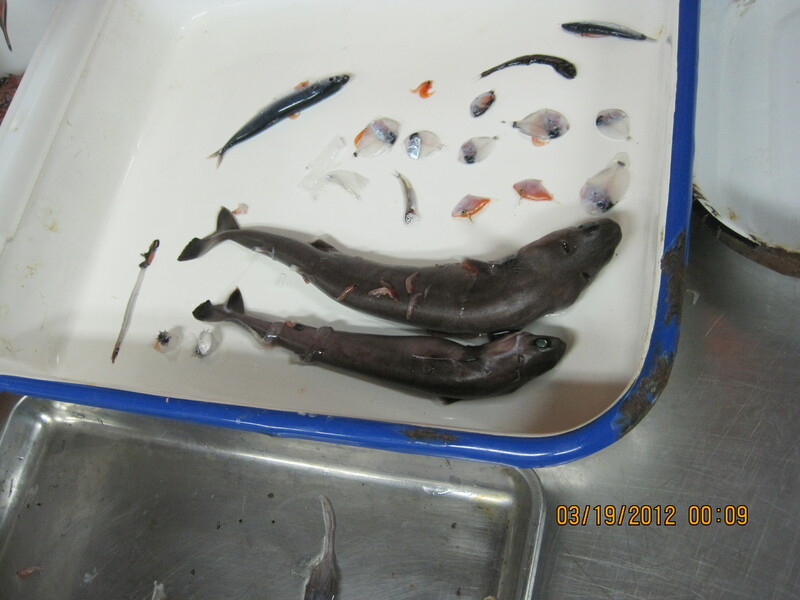 Two cookie cutter sharks came up in the Cobb trawl net. 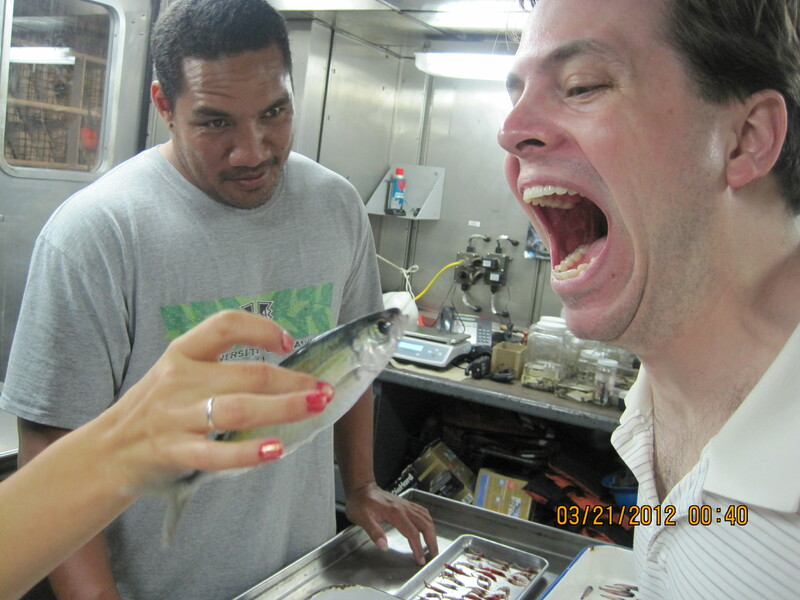 The scientists onboard the Sette were very excited to view these rare fish. The stewards/cooks on the Sette are Clementine Lutali, Jay Egan, and Jeffrey Falini. 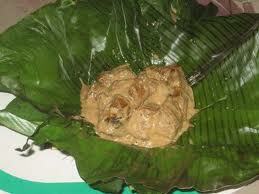 They have created the most amazing fare including traditional Samoan dishes. Clem, the Head Cook, told me that the Sunday meal in American Samoa is very important and she was right. Families in American Samoa gather in the morning for church, and then meet with the entire extended family for a large mid-day meal, followed by a nap. This includes everyone; grandparents all the way down to babies. In the afternoon families might take a walk to the beach for some family time and then have an afternoon tea with home-baked bread. Our Sunday evening meal aboard the Sette consisted of turkey gravy and dressing, roast beef and au gratin potatoes, and green papaya salad with roasted garlic and peanuts. We finished with a lovely dessert of Puligi Keke, a Samoan coconut cake served with Crème Anglaise. Mochiko lehi: a Hawaiian method of frying fish (lehi, a type of snapper) Mochiko can be done to chicken too. 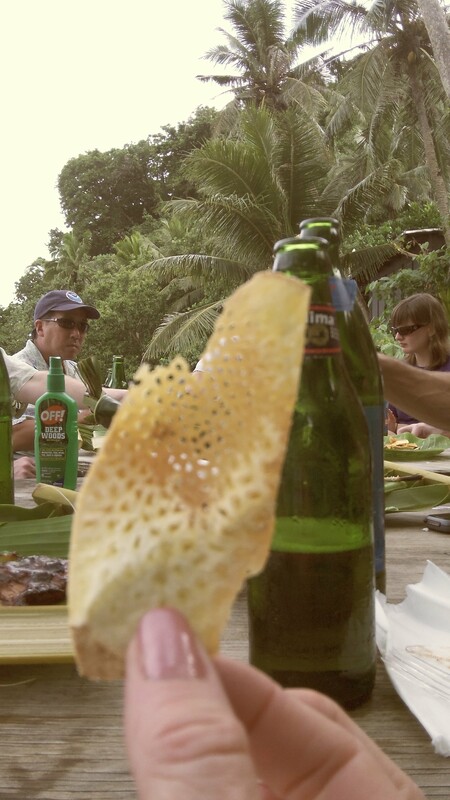 Another wonderful way to serve breadfruit is fried with a touch of salt. Yum. 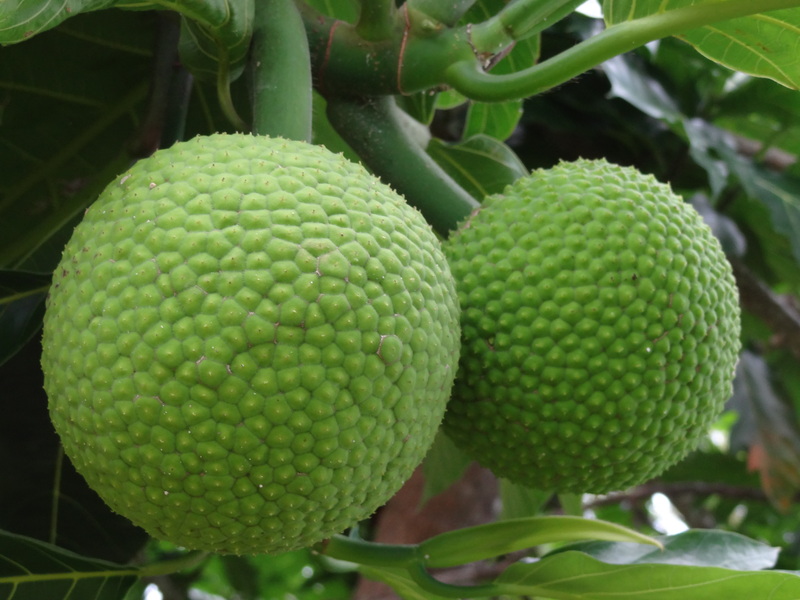 Breadfruit is a starchy staple of the American Samoan diet. 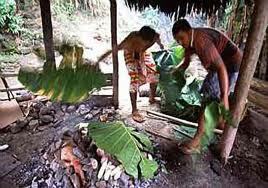 Much of Samoan cooking is done outside in an oven called an umu. Umu: Samoan Oven. American Samoans use a traditional outdoor oven. It starts with a roaring fire set in a brick oven. After the firewood has died down, hot, smooth rocks are layered over the burnt wood. Cooking continues using the hot rocks as the heat source. Fáausi Taro: Raw pounded taro shaped into balls like hush puppies. Sauce: Caramelized sugar and coconut milk. An American Samoan delicacy, Fáausi Taro is raw pounded taro shaped into balls served with caramelized coconut sauce. Panipopo: buns made with fresh coconut milk served with a fruit glaze. You’ll need two 8 1/2-inch-by-11-inch baking pans for this recipe. Set aside 3 cups of flour. Mix 6 cups flour and yeast. Heat milk, butter, sugar and salt until warm and butter is just melting (about 120 degrees). Add this to the flour and yeast mixture. Mix for 30 seconds on low speed; then mix for 3 minutes on high speed. With wooden spoon, add the rest of the flour; knead for 6 to 8 minutes. Place dough in a large greased bowl; flip once to grease both sides of dough. Cover and let rise in a warm place for 1 hour. Mix well in bowl with whisk. Set aside. Make a fist and punch down middle of dough to collapse dough. Divide dough into 2 parts; let rest on lightly floured surface for 10 minutes. Roll out into a rectangle about 16 inches by 9 inches. Brush top of dough lightly with coconut sauce. Roll dough tightly into a long roll. Cut into 9 pieces. Place in baking pan. Repeat with second half of dough. Cover and let rise another 30 minutes. Pour 3 cups of coconut cream over each pan. Bake at 375 degrees for 50 minutes or until golden brown. Makes 18 buns. 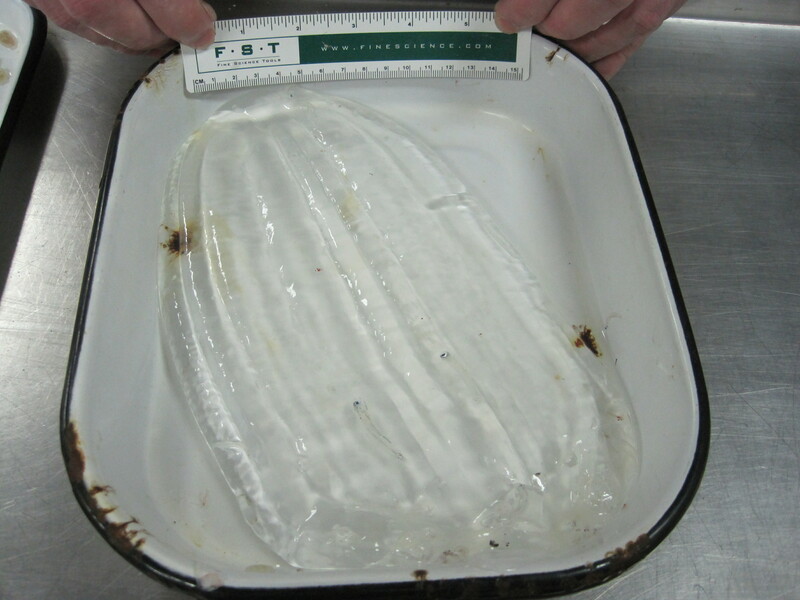 This giant salp was caught in the trawl net. After dinner, we watched fishing off the longline pit. As fish were caught using long lines, we were treated to an Hawaiian island delicacy by NOAA officer Justin Ellis, Hawaiian Shave Ice: fluffy ice, sweetened condensed milk, assai beans, your choice of syrup (coconut, pineapple, passion fruit), vanilla ice cream. 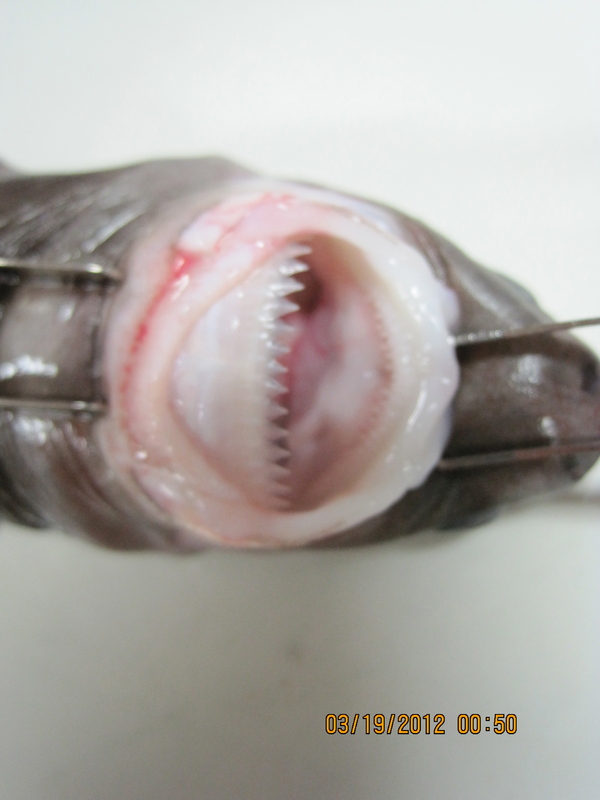 Here is a close up picture of the cookie cutter shark’s mouth. It’s small but can be destructive. 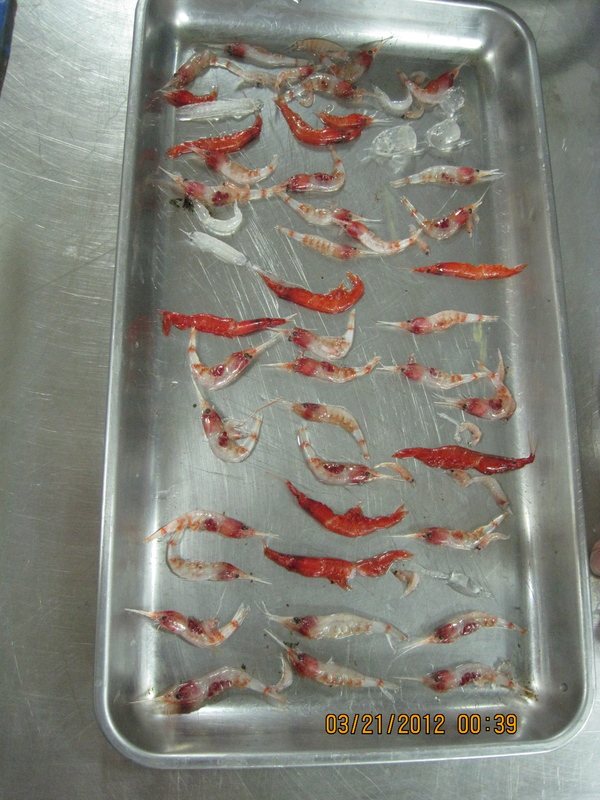 The crustaceans are sorted into a tray and then counted, measured volume(ml), and weighted (g). Scientists, like John Denton, often get hungry during late night trawls. Here he is tempted to eat his recent catch. 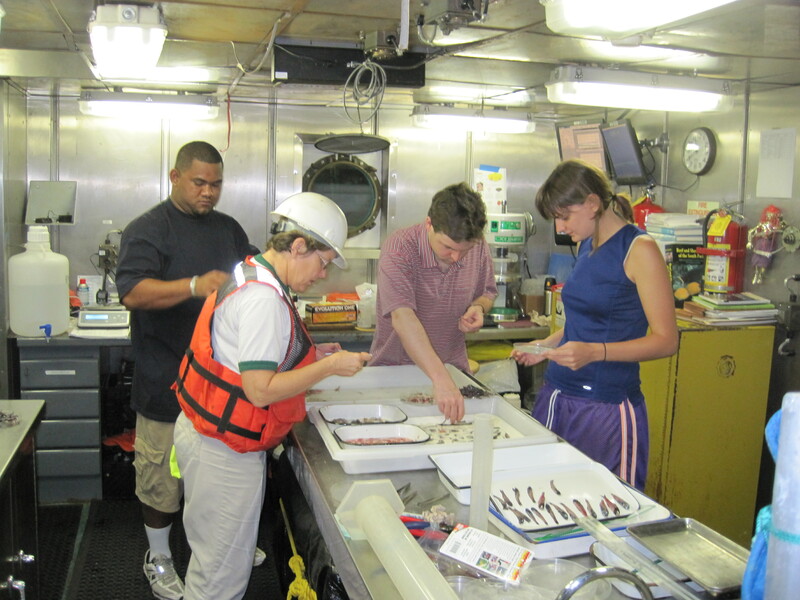 NOAA scientists, Dr. Don,Megan Duncan,and teacher at sea, Jennifer Fry in the galley of the Sette. Teacher at Sea, Jennifer Fry and scientist Tafito Aitaoto chat to NOAA scientist, Meagan Sundberg. 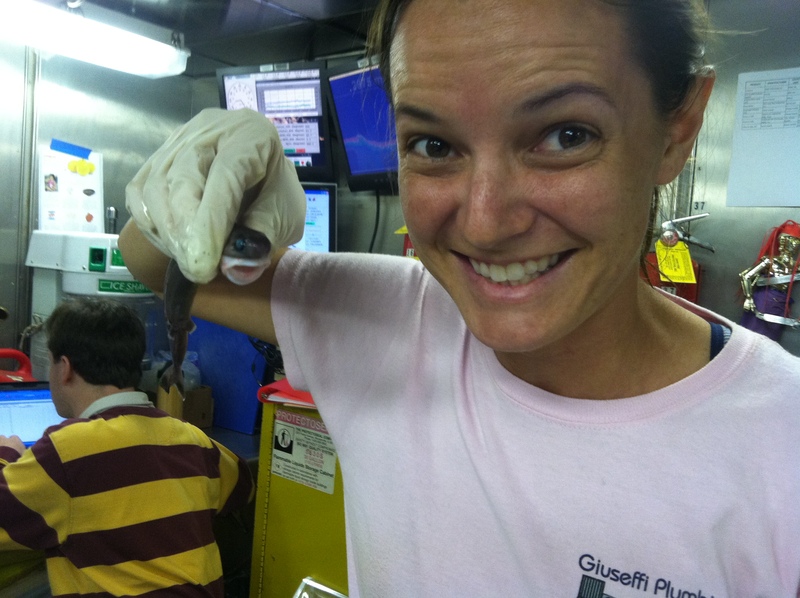 Teacher at sea, Jennifer Fry joins NOAA scientist, Emily Norton longline fishing from the deck of the NOAA ship Sette. NOAA scientist, Louise Giuseffi enjoys Hawaiian shave ice on deck of NOAA ship Sette. Teacher at Sea, Jennifer Fry enjoys Hawaiian shave ice aboard NOAA ship Oscar Elton Sette. NOAA scientist, Louise Giuseffi shows off Hawaiian shave ice machine aboard NOAA ship Sette. A beautiful sunset over American Samoan waters. We say good-bye to another lovely day off the coast of Pago Pago, American Samoa. Pago Pago, American Samoa sunset in all its glory. An American Samoan delicacy, Fafusi Taro is raw pounded taro shaped into balls served with caramelized coconut sauce. 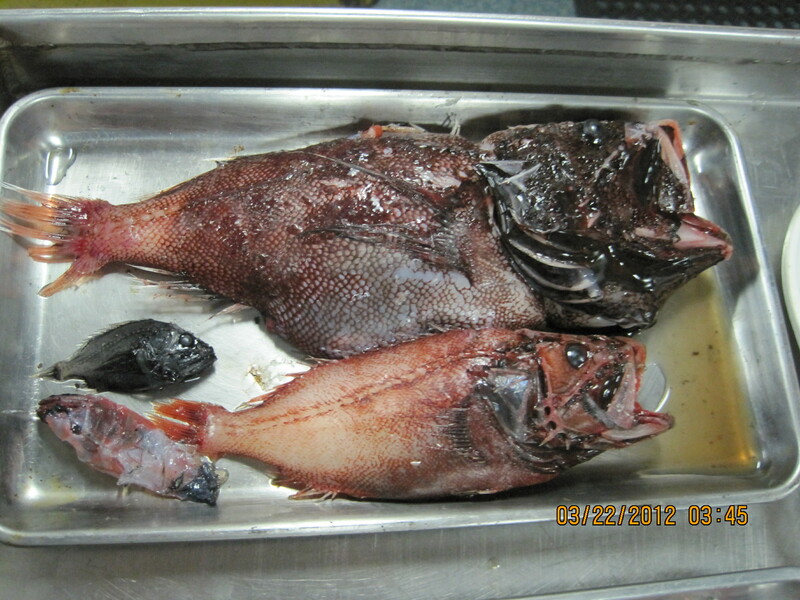 The fishing ventures were successful bringing in 2 fish: a rare Sickle Pomfret and an orange fish. I went to bed early since I would join the small boat operation in the morning. Q: Do you eat the fish you catch? A: Yes, the stewards (cooks) on board prepare the fish that is caught everyday. The snapper and tuna have been made into many tasty Samoan dishes. The bite from this cookie cutter shark can be very painful. Q: Have you seen any sharks? 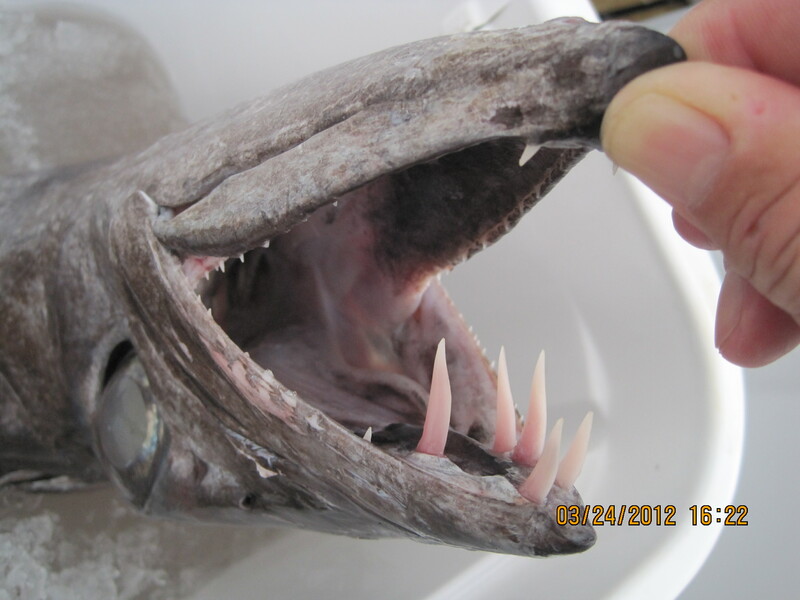 A: Yes, the most interesting shark we caught in the net was the cookie cutter shark. Its bite is very unique. As it bites its victim it turns its mouth taking a deeper piece of flesh, which makes the healing process slower. Copepod comprise approximately 85 % of the plankton population. 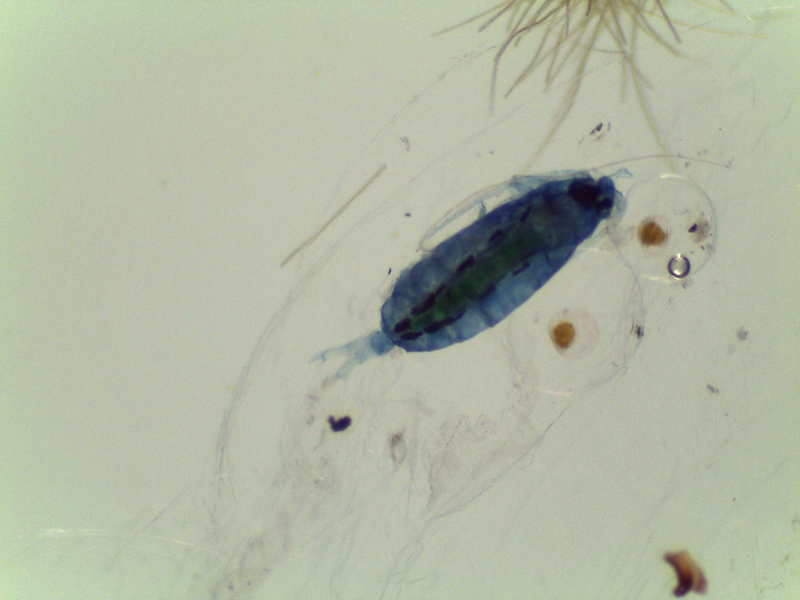 These copepods images taken with a high-powered microscope with an internal camera. Learning how to work with the plankton net was so interesting. It required careful, meticulous, and orderly work. Emily Norton, University of Hawaii at Manoa, Biological Oceanography, is conducting daytime and nighttime tows targeting plankton. She’s particularly interested in collecting and studying copepods, a type of small crustacean which comprise ~80-90% of the plankton. Plankton is a name for a variety of plants and animals that live in the water column and are found throughout the world’s oceans. Plankton are important because they are an integral part of the food chain, and they can help scientists better understand currents and transport in the oceans. Helping with the plankton tow is Megan Duncan, oceanography participant, Joint Institute for Marine and Atmospheric Research at the University of Hawaii. Together we deployed the net starting around 11:00 p.m. Due to migration patterns known as diel vertical migration, plankton can be collected more easily at night. The net consists of a 1 meter metal ring with a fine mesh (200 um) net attached to collect the plankton. At the end of the long, conical net is a collection filter tube or “codend.” This is the final collection point for all of the specimens funneled into the mouth of the net. The flowmeter is then connected across the diameter of the metal ring, which measures the amount of water flowing past it. With a crane operator’s help the net is lowered into the sea with 230 feet wire out which calculates to approximately 200 feet deep. This is called an “oblique tow” method. The net remains in the water for 30 minutes. Once brought to the surface, the net is rinsed with sea water multiple times to ensure all of the plankton are completely flushed down into the cod end. The next step is filtering the plankton-rich seawater through a very fine sieve. The plankton are either observed under a microscope or immediately preserved using an ethanol solution, 95% ethanol 5% water. Labels are then placed inside the jar written in pencil on waterproof paper, and outside the jar using indelible marker. 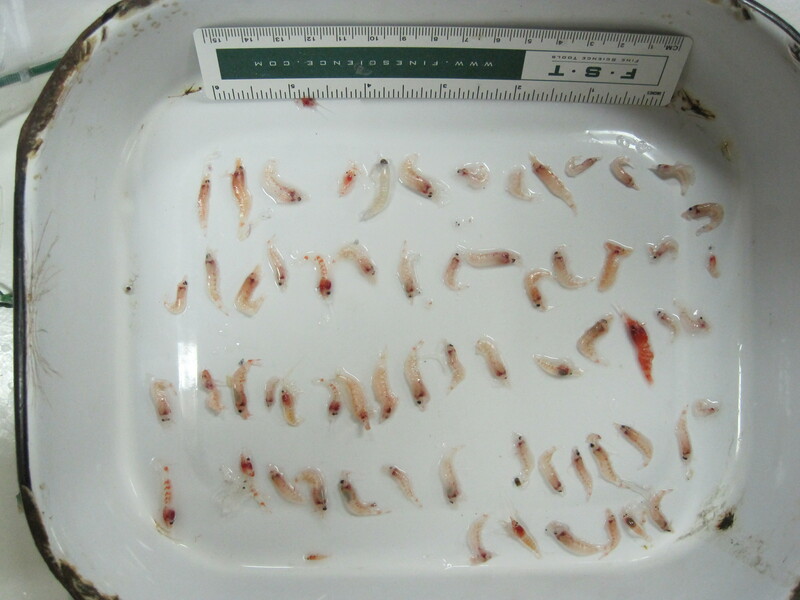 The plankton will be processed at a later date in the lab for quantitative analysis. In the lab, scientists study the plankton further, making observations and studying the DNA, Deoxyribonucleic Acid using PCR, Polymerase Chain Reaction, and sequencing. Similarities and differences (i.e. mutations) in the DNA sequences are used by scientists to determine how closely related populations of copepods are. 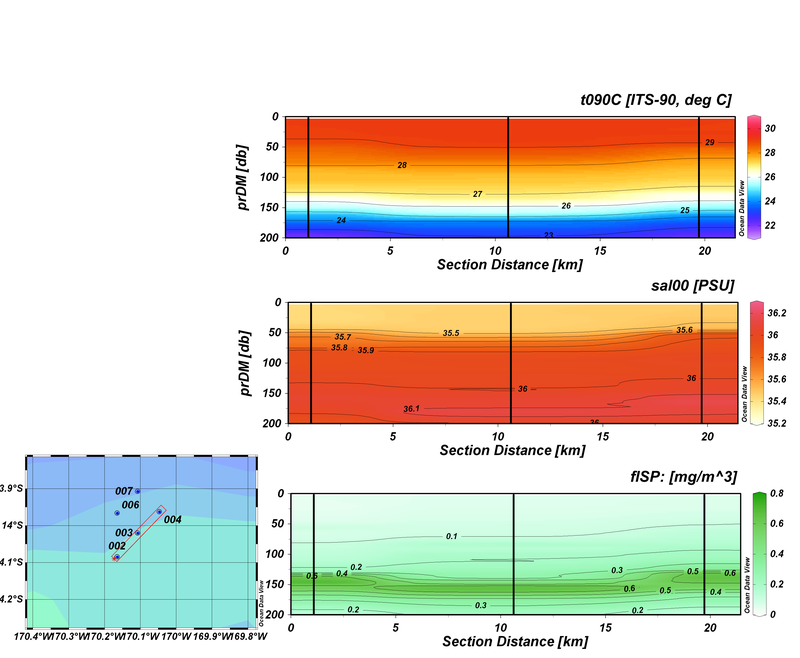 This helps scientists infer how currents affect connectivity in the ocean. Q:What fish have you had the most interest in and why? 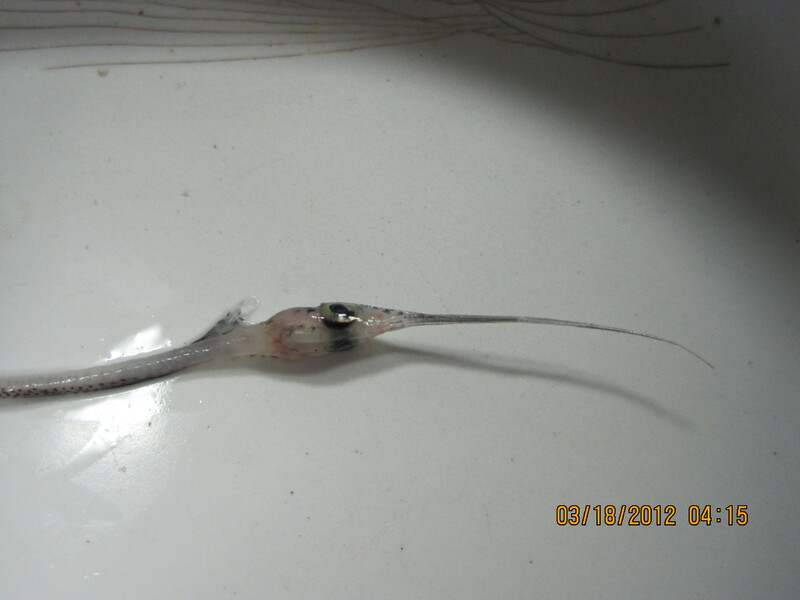 A: The most common fish caught in the net is the lanternfish or myctohid. They represent nearly 85% of the ocean’s biomass. One interesting feature is their photophores which produce light that emit from their bodies. 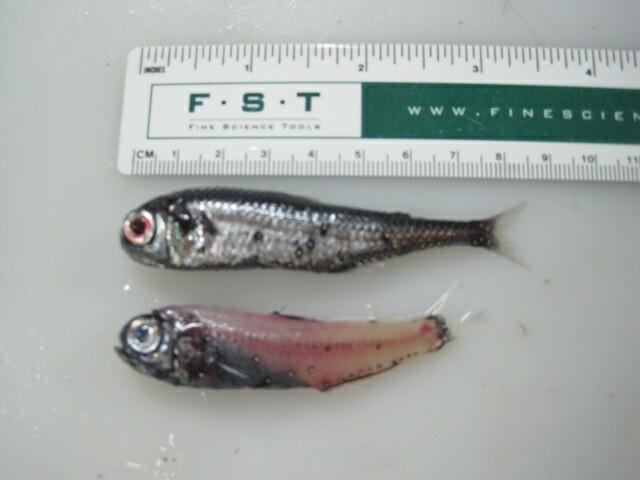 The myctophid pictured on the top is seen with its scales, compared to the bottom that shows them rubbed off due to being in the Cobb trawl net. 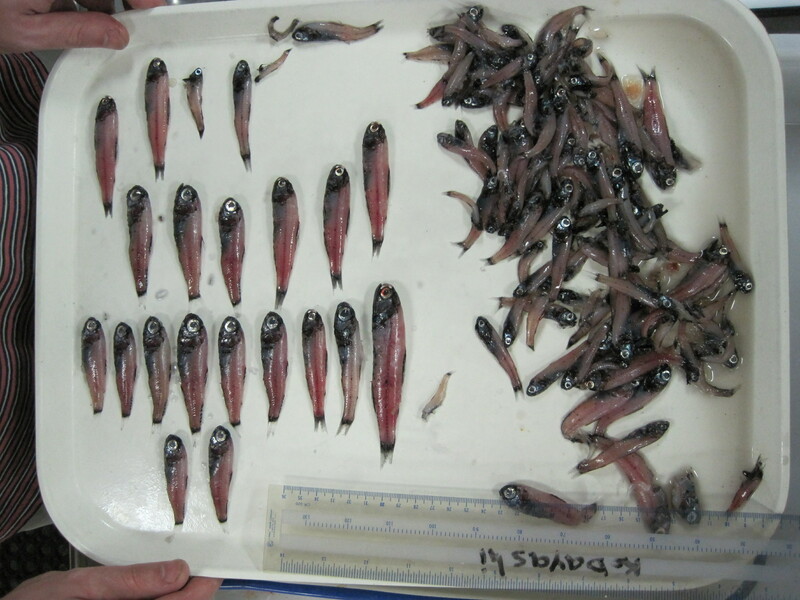 This tray of myctophids or lantern fish make up nearly 85% of the ocean’s biomass. They were the most common fish in our night Cobb Trawl nets. Q: Have you gone scuba diving? A: No, I didn’t do any S.C.U.B.A. (self-contained underwater breathing apparatus) diving on this trip. 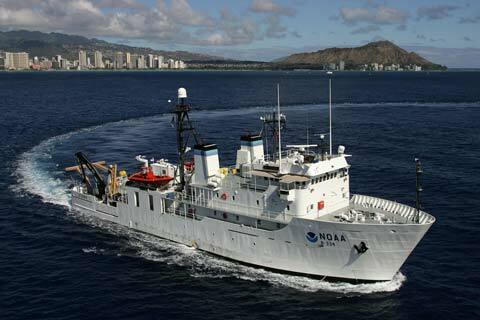 There are NOAA ships that focus on research that require diving as their method of collecting data. 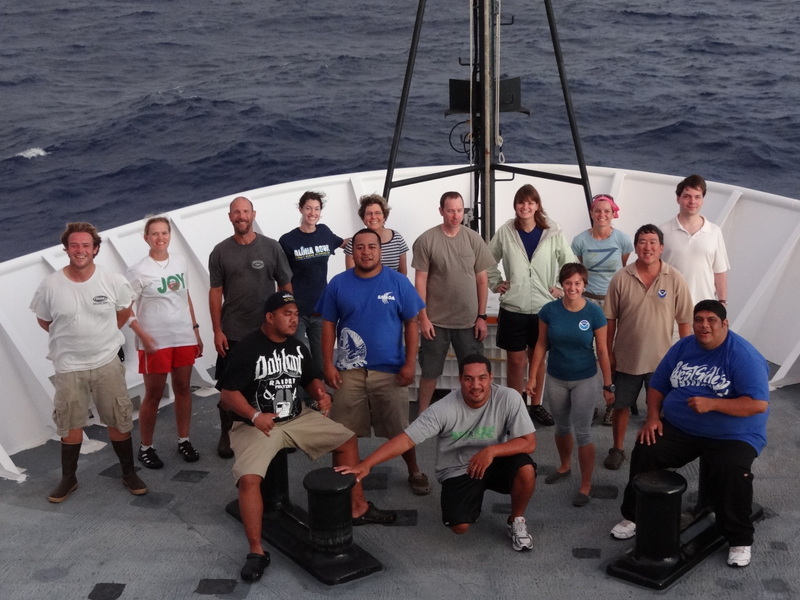 We visited the NOAA ship Hi’ialakai that researches the coral reef biome in the American Samoa waters. The NOAA ship Hi’ialakai conducts S.C.U.B.A. operations researching the coral reefs of American Samoa.